Who better than Dubai Tourism to tell us about how to spend 72 hours in the city? 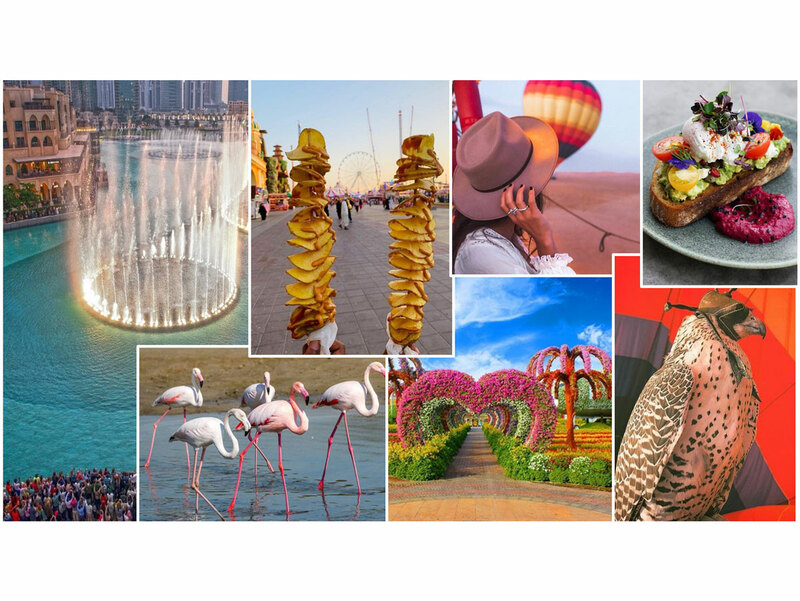 Following the launch of the #MyDubai social media competition by Dubai’s Department of Tourism & Commerce Marketing, residents across the city have been uploading inspirational images onto their social media platforms for a chance of winning two Emirates return flights for their friends and family to visit them. Foodies will have a selection of restaurants, cafes and unique food concepts, all just a stone’s throw from the waters of the Arabian Gulf. Kite Beach’s promenade has a variety of spots to relax and tuck into tasty fare while feeling the sand between your toes – including Park House, The Surf Cafe, Salt Burgers and Al Ijaza Cafeteria, which serves up old-school classics to grab and go. A visit to Al Fahidi Neighbourhood offers a great opportunity to get acquainted with Dubai’s old way of life, reflected in the traditional buildings featuring wind towers (Barajeel) built out of stone, gypsum, teak, sandal wood, fronds and palm wood. Wander through the narrow alleys, pathways and public squares, and discover the beauty of old Dubai. Don’t miss the area’s various art exhibitions, specialised museums, cultural centres and quaint cafés, restaurants and guesthouses. Located in Al Fahidi Historical Neighbourhood, one of the oldest in Dubai, the Sheikh Mohammed Centre for Cultural Understanding (SMCCU) serves traditional Emirati lunch in the ambience of a beautifully restored wind-tower house where visitors can enjoy a meal with local flair while chatting with an Emirati host about UAE culture and customs. Discover the city's shopping heritage at Dubai’s souqs, with gold jewellery, hand-woven fabrics, traditional oud fragrances and quirky knick-knacks. A wander through one of Dubai's bustling souks is an essential experience for both visitors and local hosts. The shopkeepers are friendly and chatty, and more than happy to introduce lesser-known spices. Remember, haggling is not only accepted, it’s encouraged! VR Park, a Dubai Mall attraction, combines augmented and virtual reality. Try the Burj Drop experience, where you’ll propel down the side of the Burj Khalifa. If that’s too tame for the teens, try and survive a zombie attack at The Walking Dead Outbreak VR game, or navigate a spaceship to safety. Younger children and families also have plenty to enjoy, making VR Park a treat for all ages. Watch the Dubai Fountains from a number of dining options in Downtown Dubai. Whether you opt for the French feel at Madeleine Cafe & Boulangerie, the relaxing ambience at Thai eatery Thiptara, or Italian dishes enjoyed on the outdoor terrace at Serafina, these are prime spots to take in the beauty and charm of Dubai’s most popular son-et-lumiere show. Start the day unwinding at an oasis of quiet and calm at Arabian Tea House. Set in the historic Al Fahidi district on the Bur Dubai side of the Creek, the tea house offers everything from breakfast platters, healthy sandwiches, salads and dips, to pastries, refreshing mint lemonades and more than 100 types of tea – including a house special blend of black tea with fruit and herbs. Aquaventure at Atlantis, The Palm offers the perfect splash-filled break for the entire family. Choose from record-breaking rides and slides, close encounters with sharks and rays, or simply relax on 700 metres of private beach. In a city like Dubai, where a communities and cultures come together to share memories of their homeland, Kaleidoscope gives you the opportunity to visit the world through food. Located in the Atlantis, The Palm, the restaurant is popular for its buffet atmosphere, with live cooking stations and alternating themed nights that serve Arabic, Indian, Mediterranean and other various international culinary specialties. It's the perfect venue for catching up with friends. Dubai Parks and Resorts offers children and the young at heart, mega theme parks like Motiongate, Bollywood Parks and Legoland Dubai. Featuring more than 100 incredible indoor and outdoor rides and attractions, this labyrinth of fun will keep guests enthralled. You can even take a rest in Riverland Dubai’s entertainment and dining boulevard, which offers an array of options for the whole family. For a quintessentially Arabian experience, book yourself a desert safari that highlights the local Emirati culture and heritage set amidst an ultra-luxury desert landscape. Complete your Dubai experience with a traditional feast and performances as the sun sets. You can even catch a glimpse of native desert animals including gazelles and Arabian Oryx, or you can trace your way through the desert on a traditional camel convoy. Whether it’s sandboarding, camel or horseback riding or going on a desert safari, this is one adventure the kids will love. Drift 1,200 metres above the dunes, over green oases with oryx, gazelles and wandering camels in their natural habitat below. Soar the skies with the teams at Balloon Adventures, Sindbad Balloons or Platinum Heritage for a sky-high tour, from pick-up to take-off. Start your day at Dubai’s famous breakfast-only destination, Cocoa Room, which you’ll find in the Galleria Mall at Jumeirah 1. A perfect place for chocolate lovers where even the decor is delicious, everything has been considered, from the seating to the dark auburn tiles shaped like blocks of chocolate which cover the ceiling. Visit the floral paradise at Dubai Miracle Garden. Located in Al Barsha South, the 72,000sqm garden is home to the region’s biggest flower garden with more than 50 million blooming flowers. Feast your eyes on blooming pyramids, stars, igloos and hearts, take in the record-breaking wall of flowers, or enjoy a stroll under a ceiling of colourful umbrellas. Take a stroll into Dubai’s exciting urban precinct – City Walk, combining shopping with entertainment, a cinema and a year-round calendar of events. Families will enjoy the European-style pedestrianised boulevards, stretching several blocks from the city towards Jumeirah. Popular dining options include the modern-Indian restaurant Farzi Cafe, French fare at Aubaine, Emirati fusion spot Sikka Cafe, and Cocoa Kitchen for the sweets lovers – to name a few. Translated as ‘Cape of the Creek’, Ras Al Khor Wildlife Sanctuary sits at the mouth of the Dubai Creek and is among the few protected urban areas in the world – a critical staging ground for the wintering birds of the East African to West Asian Flyway. This wildlife haven covers an area of 6 sq km and features a combination of salt flats, intertidal mudflats, mangroves and lagoons, supporting over 20,000 water birds and 67 species. The site is also home to more than 500 species of flora and fauna and is one of the best-managed arid wetland zones in the region. Global Village is Dubai’s leading family entertainment and cultural attraction offering a unique shopping experience from over 70 participating countries presented in over 36 pavilions, each representing a different country. Offering a collection of 22 international dining options along with thrilling rides, this annual entertainment and shopping destination is open from November through to April. The #MyDubai competition will continue to select two winners each week until 31 January 2019. Visit https://www.visitdubai.com/en/vfr-competition-terms-and-condition for all terms and conditions.